Since I’m teaching about business in my current class at ICPNA, I decided to start a class project to open a coffee shop on the Plaza de Armas in Cusco. We already have a McDonalds in Cusco and will soon have a Starbucks, so let’s give them some competition. Our fictional business will be a fancy coffee shop with yummie breakfast, snacks, etc. We will have wireless internet, friendly service and a hip atmosphere. What kind of things we will sell. Legal stuff: how to set up a legal entity (EIRL, SA). Financial plan and accounting policies. Let’s not get in trouble with SUNAT or my uncle Alan Garcia. A good location in anywhere in beautiful downtown Cusco Peru. Ideas on how to reward our employees. Policies / ideas to prevent theft from customers and employees. Suppliers: where to get good food, coffee, drinks, ice cream,…. Also furnishings and furniture to open our place. Lobbyist to have lunch with the mayor and governor of Cusco once a month. Exit strategy, meaning, what to do if our business doesn’t work out. Any other advice or items I’ve overlooked. Write at least 2 or 3 comments before the end of our class next Friday 9/26!!!! Any thoughts and ideas are welcome, explain/justify your ideas. 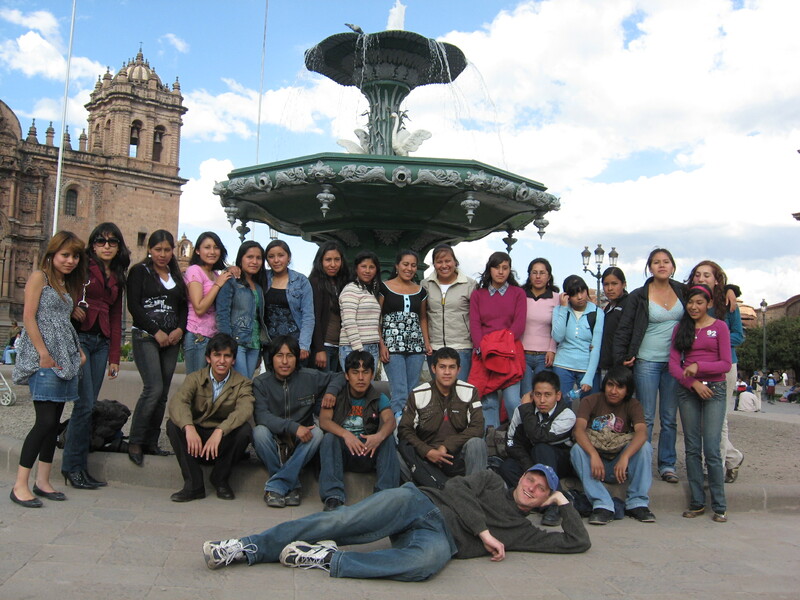 This entry was tagged Cusco, education, ESL, ESL teacher, ICPNA, Life in Peru, Peru. Bookmark the permalink. Hello teacher Ward, this project is great. I hope my ideas will help you.It is about the name.I think it could be something that join both language, for example: “COFFEE WASI” it means LA CASA DEL CAFE. And the slogan could be “COFFEE CAN MAKES YOU FEEL GOOD WHEREVER YOU ARE”. Well, you want ideas if it won´t work. I think my dear teacher you have to be positive, your mind is your power to succeed, come on! you can if you really want. Think about problems just when they come.It is my advice. I´m sure you´ll be fine. Believe me. I can´t think of any good name … it´s really hard but I think that a good location for that kind of business is the ,main square or some place near there. If you want to have many customers I think you should have good publicity by making comercials on the main channels. Well Teacher, This is Brian!! For Me a nice name for this coffee shop would be Sweet Caffeti!! This coffee shop would be located on the main square in “Portal de Panes”, where most people can see this place easily. *Something that waiters and waitress will dress would be a cool uniform, that contein a nice cap, and all the stuff would wear white t-shirts, that would be how most people see the quality that our coffee restaurant will have. People who would work with us should be from 18 to 25 years old. *We would hire a security who can take care of the place, the door and everything we have there. *Also we can install some cameras that record everything that would happen on our place. *For making famous our coffee restaurant, We would put some propaganda on the bus stops wich is famous, in the airport, and also in TV, Radio and Internet (We can create a web-site). *If Our Local does not work out anymore, we can look up for help, or to make an aliance with some international restaurants to hel ups..!! Hello teacher ward , these are my ideas…. I think that many employees see in the personal recognition something that is more important and stimulating,too than the money. – The owner should have an indirect influence on their employees instead of demanding certain performance. On the other hand you can show them that you feel pleased for everything they have done and how it helps increasing and improving the business. – If our business doesn´t work well I think that we could create more value to our business and more input when we expanded our business by offering more services associated with others such as for opening a bar at night for the presentation of music groups for weekends or creating entertaining games for young people who will come frequently to local, I think that in this case, the inversion would be low because the other part would be committed to the business, too. And when the business is stable is the time when we may sell. hello teacher ward,when i work very hard I don´t have good ideas but I gie you some suggestions for open your our bussines I hope you can help. * for your employees it is necessary that you give extra money for incentive for work better for you. well not necessary money another things like vacation, free times when they need. *another is to give a good treatment for your employees becouse if you ive a good treatment they will work better, with a lot enthusiasm and you don´t have any problems with your employees. well I think that all this suggestion can help you it is necesary to be consentrate in a in all thing that you do. thank you very much for teach us this month and sorry for all the moments that we did it happened bye teacher and hope that you teach us in the next month you are good teacher. First, the coffee shop has to be in the main square or any place near there. Then, the things that we will offer could be coffe, ice creams, some peruvian food on day for the tourist and latin people or people that want to eat and also at nights we can sell some kind of drinks with good music. The waiters or waitresses have to wear black or white t-shirts with slogans with the name of the coffee shop or something like that to identify the business. The name mmmmmm the name … mmmm I don´t think any good name because it´s too hard for me jajaja. Before we open the business we have to go to registrate the business and know what are the requirements that we need to open the coffee shop or something like that. For the publicity of the business we need some commercials on the main tv channels and on the internet too for example we can create a web site for reservations and for the publicity. Hello teacher Ward this is Elizabeth!!! well i will give some ideas for your coffee shop, the ideal name could be “the ancient coffee”, this coffee shop should be located in the main square or near there, about the decoration it can be with tipycal things of our ancenstors, the walls can be like the inkas walls with trapezoidal niches ans the tables and sits have to be rustic. Your Employees (waiters and waitress )will dress a cool uniform, that contein a nice cap, all the stuff would wear white shirts(with someting tipycal blanket of cusco),and black pantsin order to most people see the quality that our coffee restaurant will have. People who wants to work with us should be from 18 to 25 years old, if we want that our bussiness succed the employees has to have initiative, charisma, good communication skills innovative, optimistic and honesty. if we want to have a lot of costumers probably we can do “Happy hours” like mama africa on weekends afternoons(Happy Weekends) we can offer them pay one and get two something like that. and for the marketing of our coffee shop we can use the tv , radio, full-page ads,billboards, flyers also we can invite them a free samples of our deliciuos coffee. I hope that my ideas could help you if not just tell me and i will help you again. bye my dear theacher Ward see you soon………. I really don’t have ANY ideas …. because i am not such a creative girl. hi teacher about this project i was thinking about the alertnessut of the coffe shop. We need to put cameras, one or two for the cashier and approximately two or three in the restaurant to see how people is working and to see the class of attention that clients are receiving and also to improve this attention anothe thing that we should do is a type of strategy to attract more clients , for example offer more regular coffee if someone ask for more coffe we just give this person coffe without charging and to do a very cozy decoration where the people could feel like in home with a good attention and a good coffee and also different varieties of desserts cakes, etc so that way we can make a difference with the different coffees that exist in cusco. Well teacher actually I can´t say a good name for the coffee but I think that we could make a thematic coffee, I mean we could make a coffee related to soccer, or something attractive. We can sell coffee of all the varieties and also some ideal cakes or pies to eat them with the coffee and to attract the people we can make crazy promotions. In order to cause that this works first we must make a study of market (this told me a friend who study business) then we must think how to form our society, this will depend of the number of people in the business for example if the owner is more than one person we can form a Commercial Society of Limited Responsibility (S.R.L) or if the owner is only one person we can create an Individual Company (E.I.R.L) or also even can create an Open or Closed Anonymous Society. We can rent a local in the main square or near. For the employees the policies must be hard and by this way we can prevent inconvenient in the future. Finally I have to say that to make anything good we just need the desire to do it. -first you need to find a place in the center of the town . -second you can buy coffee fromquillabamba bcouse is good . -you can hire people with experience and they can wear typical cloths. .inka´s arms, typical mantles,ceramics . -you need a big tv where the customers can watch the soccer games or other things or have good music that combine with the decorate of the place. -you must hire a fiendly staff. -is important have differents kinds of snacks with tropical flavor .and some of fat food. -maybe have specials days and food . -the last advice for you teacher is make a party for the inauguration of the coffee shop and call to friends and and students . well teacher i thing that this letters can help you see you next. I like to recoment my accountant, because he is very professional and knows alot about the bussines, his name is Victor Orellana and work in front of the SUNAT. If you like to start your bussines you need a documents and register your coffee shop on SUNAT, it is important. to spend your time and to relax. is important that the employees have a good treatment to the customers because in there is success,also offer differents kinds of food,drink. everthing is gonna be good. well i think the best name for your coffee shop is “inca´s coffe” or “house of the coffee”. I recoment you that your coffee shop can located in the main square, well you need legal documents for star your bussines and need to register those documents to the SUNAT well i think that i give you a good advice. well good bye teacher . Ward — This is an excellent real-life project for your students. Peruvian coffee is superior to that of McDonald’s, and a Peruvian coffee shop deserves to be on the Plaza de Armas (unlike Starbucks, which is an American conglomerate). I believe your students should highlight those points in their project — they are selling points, IMO. Thanks for the comment “el kibitzer”. I like your idea, all the trendy special coffees aren’t my thing either. Just give me a good cup of real Peruvian coffee, hot and strong! HELLO Teacher, i hope that i can help you, well about you}r business I think that you choise a good name an original too (like Accchita coffe jjee; well is one idea) but i think the name of the business not is the important, the point is the people or what kind of custumers would you like to have local people or foreign people, and other is the location, well acording this you must to decorate the place of business. I don’t have many things to say, but.. I really need the extra points. To start a business like a restaurant you need a name of course, it may be.. MAMA VICKY, it always works, also you can choose a good place, near to the main square perhaps or in the downtown, you have to decorate it with ethnic things, the chairs or the tables can be of wood or something like that, of course you have to have a good cheff, and a nice service staff.. well teacher that all I can tell you.. because our class is going to begin, and i want to be on time!! If we decide to open a new coffeeshop, this have to be on the main square, I thinks that the name could be in quechua por example”sumaq miski” well is one idea. This place must be nice, confortable, friendly and cheaper, where all can go such as a local people as foreing peolpe and interchange ideas and customs. the local must be light and big where there is fine music, and the employees must be trustworthy and has charisma, I think than should wear a funny uniforms and confortable. we should offer a good food, fast food, drinks, coffee, all kind of cake after that we go to sunat for register our local and get a RUC and get a Hability in the municipality. FIRST: HOW BUSSINES DO YOU LIKE TO OPEN? I THINK THAT AN AGENCY IS A GOOD BUSSINES. “ROUTES OF THE SUN” OR “RUTAS DEL SOL” IF IS IN QUECHUA LANGUAGE IS BETTER. SECOND: LOCATION IT IS IMPORTANT TOO,AROUND THE PLAZA DE ARMAS IS EXCELENT FOR ME BECOUSE MANY TOURIST WALKING AROUND. THIRD: GETTING STARTED WITH THE BUSINESS NEED TO MAKE SOME OFFERS JUST GETTING STARTED,AND OLSO THE CREATIVITY IT IS NECESSARY . THAT ALL TEACHER THANK YOU FOR TEACHING US THIS MONTH GOOD LUCK FOR ALL YOUR BUSSINES THAT YOU PLAN.